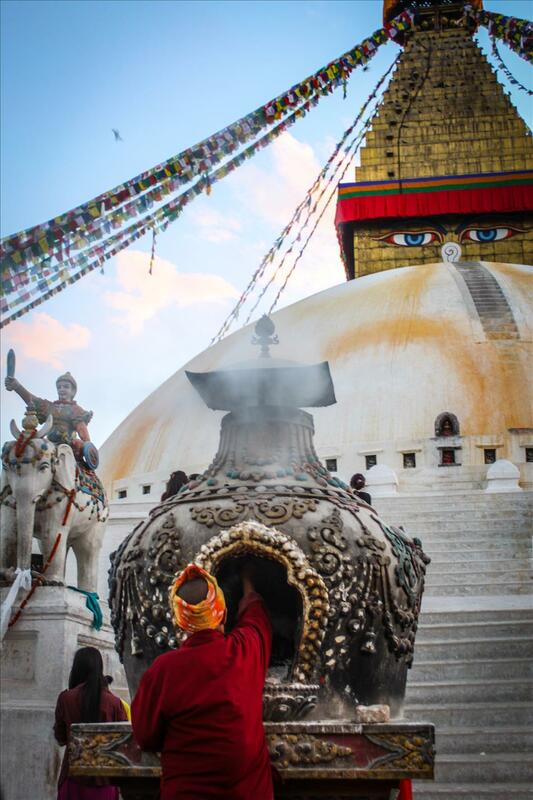 The finale of my temple trotting journey through Kathmandu brought my tired legs to the Boudhanath Stupa: the holiest place and largest monument in Kathmandu. 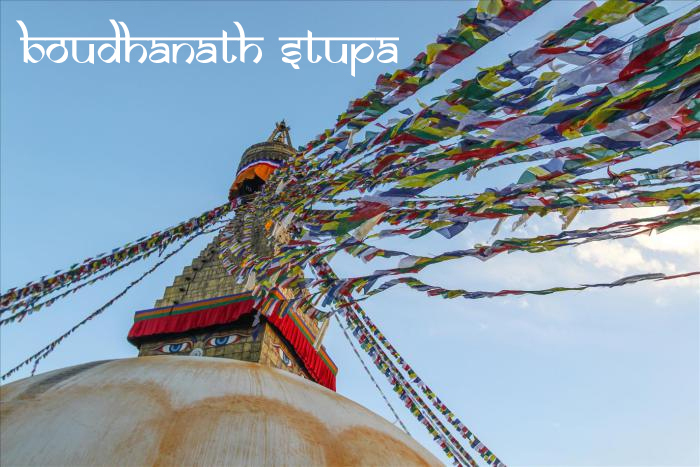 Visiting the great ancient mandala of the Boudhanath Stupa is one of the most important pilgrimages for Tibetan and Nepalese Buddhists alike. The site houses the largest single standing stupa (Buddhist monument containing relics or human remains) in the world and is said to entomb the remains of the Kassapa Buddha. The area around the stupa is in perpetual clockwise motion as visitors spin prayer wheels that surround the circular monument. Shane and I climbed the entrance way stairs to get a closer view of the gold plated stupa pinnacle and stare into the shining eyes of Buddha. The view from the platform makes it possible to see the monks and nuns performing sacred rituals within the walls of the monument. The acts of lighting of incense, praying, chanting, and prostrating oneself on wooden boards show devotion and respect to the illustrious enlightened one. It was so beautifully obvious that we were treading important and holy ground. Silent reverence fell over us and we spoke in whispers to take in the scene quietly and fully. The timing of our visit was perfect because we arrived late afternoon and ended up watching the sun sink below the horizon from one of the many rooftop cafes that offer a stunning view of the monument. The sun set turning the sky from gold to pink to blue and the ground lit up as the surrounding merchants and restaurants hoped to draw in visitors like many winged moths to the light of their doorways. The shining gold of the temple dimmed in the shadows of the night and the eyelids of Buddha seemed to hang just a bit lower than before as if taking a rest from welcoming so many visitors and receiving so much devotion all day. 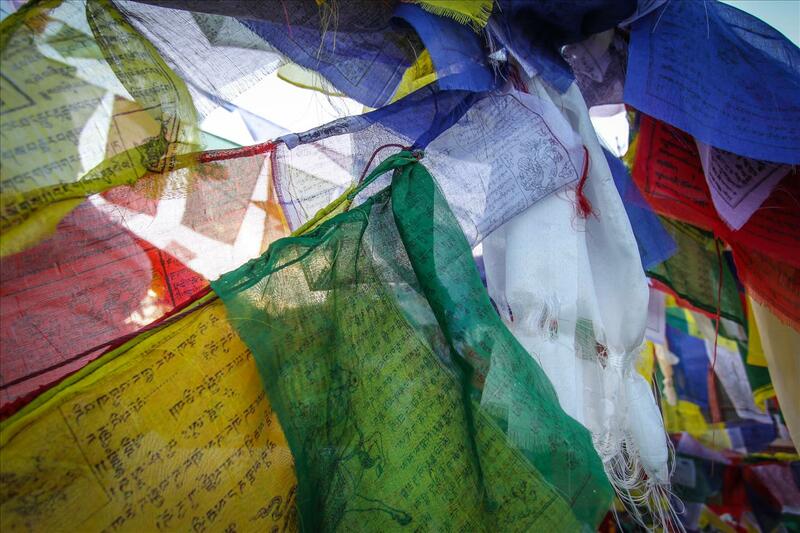 The customary greeting and farewell of Nepal is Namaste which means I bow to the divine in you. 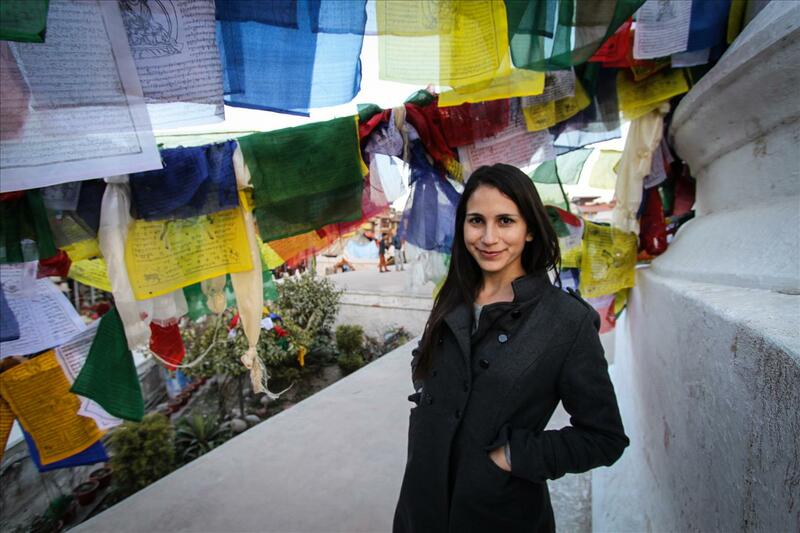 After visiting just some of the gorgeous historic temples that Kathmandu has to offer, I really felt like giving a Namaste to the incredible richness of Nepal.